“A person of the calibre of Plato, Aristotle and Pythagoras,” Abul Kalam Ghulam Muhiyuddin, who was respectfully known as Maulana Abul Kalam Azad, was a revered freedom fighter, politician, journalist and educationist. He was also a strong advocate of harmony, unity and education as a means to empower citizens. Azad was born in Mecca, Saudi Arabia on 11 November 1888. His father was an Indian, while his mother was an Arab and the family moved to Calcutta (Kolkata) when Azad was just two years old. Here, he was home-schooled in the subjects of mathematics, philosophy, world history, science and in languages like Persian, Urdu, and Arabic. While pursuing his traditional Islamic studies, it is believed that Azad started learning English without his father knowing about it. From a very young age, Azad was influenced by the teachings of Sir Sayyid Ahmad Khan about the importance of a well-rounded education, and so, along with English, he embarked on a quest to read about western philosophy, history and contemporary politics, travelling to Afghanistan, Egypt, Iraq, Syria and Turkey. Azad started composing Urdu poetry as well as treatises on religion and philosophy early in life. Azad, in fact, was a pen name he had adopted. The early interest in education and composition had made him a staunch nationalist, and he would critique the policies of British and their injustice against his fellow Indians in his weeklies, Al-Hilal (The Crescent) and later, Al-Balagh. He was greatly influenced by Gandhi’s non-violent civil disobedience movement and worked with the Mahatma to organise efforts for non-cooperation with the British against the Rowlatt Act of 1919. The British tried to shut his voice by banning his publications, but Azad kept moving, leading the Khilafat movement and becoming the youngest president of the Indian National Congress in 1923. He was later imprisoned for participating in the Quit India Movement. As a prominent member of the Congress, Azad was instrumental in leading several debates that were the basis of the education policies in our Constitution. It comes as little surprise then, that Azad became the first education minister of independent India. With a keen interest in politics, history, languages and with the firm view that education would show the path to the nation’s development, Azad was the perfect choice to lead the Indian education system. One of the most crucial points he focused on as the Minister of Education was the education of girls and the rural poor. “We must not for a moment forget, it is a birthright of every individual to receive at least the basic education without which he cannot fully discharge his duties as a citizen,” Azad said at a conference on all-India Education in 1948. Initially, there were some disagreements among about whether education should be the responsibility of the Central governments or the state. Maulana supported the Centre in this regard because that would ensure uniformity but several other leaders argued that since India is a culturally diverse country, a uniform rule on education wouldn’t do justice to it. Finally, the leaders met midway by enlisting education in the state list but including certain entries of higher education in the central list. 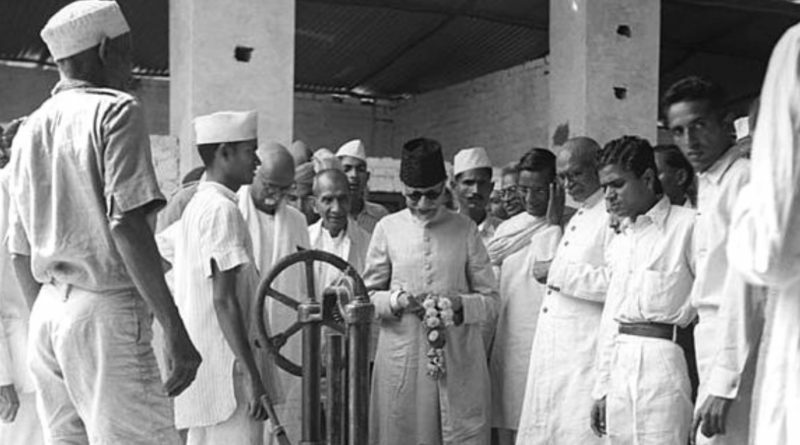 He founded the All India Council for Technical Education in 1945, Sahitya Akademi and many more institutions. It was under his leadership that the Central Institute of Education in Delhi (which later became the Department of Education of the University of Delhi) was set up as “a research centre for solving new educational problems of the country.” He was also instrumental in setting up the University of Grants Commission in 1953 and the first Indian Institute of Technology (IIT). Seeing the promise of the IITs, Maulana also focused on the development of the Indian Institute of Science in Bengaluru as well as the Faculty of Technology at the Delhi University. “I have no doubt that the establishment of this Institute will form a landmark in the progress of higher technological education and research in the country,” he had said. “A very brave and gallant gentleman, a finished product of the culture that, in these days, pertains to few,” was how Jawaharlal Nehru had described Azad. He was posthumously conferred the Bharat Ratna in 1992 but what could be a better recognition of his work and life than his birth anniversary being celebrated as the National Education Day?